Spray foam insulation seems like an unnecessary expense to make. 1st Class Foam is going to explain you why spray foam insulation is the best investment you can make for your Arizona residential and/or Arrowhead commercial spray foam roofing building. Spray foam insulations may be the simplest, best material that you can have installed in your building. There are ten must-know truths about the benefits of spray foam insulation. It reduces the energy consumption by helping prevent hot and cold air infiltration. In average, 40% of a building energy is lost due air infiltration. Gaps, holes and air leaks can make energy bills unnecessarily high and let valuable resources go to waste. These gaps, holes and air leaks are found on the roof and the exterior walls of your building. Spray foam acts as an air sealant. It closes those nooks and crannies that let air escape, which explains the increase monthly energy bills. Spray foam can save you up to 20% on those energy bills. It will create a comfortable indoor environment by preventing allergen and moisture from entering the building’s interior. By sealing the building's air leaks, it prevents drafts from windows, doors, attics, and floorboards. Which means that the indoor temperature of the building is in control. Arizona is a very hot state. It’s get irritating when the temperature is set on 75 degrees, but the air-conditioner is always on! During the winter, the house or building is never warm enough. The spray foam insulation will fix that. Plus, since every gap and hole is covered by the foam spray, it will keep tiny critters out of your building. Provides additional building strength. The words “spray foam,” may give you a feeling that it’s not a strong component. Well, that’s not true. Spray foam insulation builds the strength of your home/commercial building. Once the spray foam hardens, it very stong and durable. The building will be strong enough to resist wind uplift. 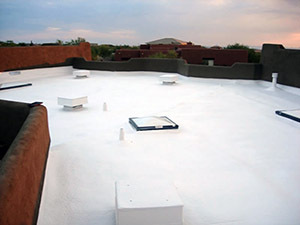 Also, during the hot, brutal summers of Arizona, a foam roof will be to reflect the UV ray. It will prevent your home/commercial building from turning into an oven. Offers design creativity and flexibility by fitting hard-to-reach places or complicated structures. What so fascinating about sprayed foam is its chemical structure. Initially, the sprayed foam is liquid. Whenever is initially sprayed, the liquid form will flow into all the hard-to-reach places. Then, immediately, as it settles, it will turn into a solid form. Allow for small HVAC units. Since the sprayed foam is an insulation, it keeps everything at the temperature it's been set. HVAC units are used for residential, commercial and/or industrial buildings. If the building has spray foam insulation, the need of HVAC will be minimal. The building won’t need an enormous equipment to control the heating and cooling temperature. As a homeowner and/or commercial property owner you’ll be able to invest in small HVAC units. Reduce construction costs. Within some buildings, additional construction might be needed to control the temperature of the building, and repair air and water leaks. Spray foam insulation will eliminate the majority of construction that might be needed. Lower maintenance cost. Sprayed foam insulation can be installed around the walls, flooring and roof. Think of every maintenance and repairs that the sprayed foam can eliminate from your hands. You will not have to worry about gaps, holes, and cracks for approximately 20 years. Reduced repairs for roofing systems. The sprayed foam insulation can also be applied on the roof. The spray foam roofing contractor in Arrowhead will be able to spray the foam on every inch of the roof. The foam will fill in every crack and cravesses that the roof may have. After the first coat, a re-coat will be needed in five years. After that re-coat, there won’t be another necessary re-coat after twenty years. Within those twenty years, you will have to do minor repairs,but nothing major. It reduces the repairs for roofing systems. Fast Installation. Depending on the size of the structure, the installation of sprayed foam insulation in Arrowhead can take two days to a few weeks. That means that the contractor(s) will be around making noise for a short period of time. It’s for every building in Arizona. 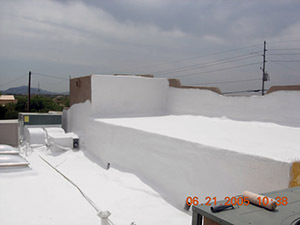 Every residential and commercial building in Arizona can benefit from sprayed foam insulation. It can be applied on any roof and around the foundation of the building or home. 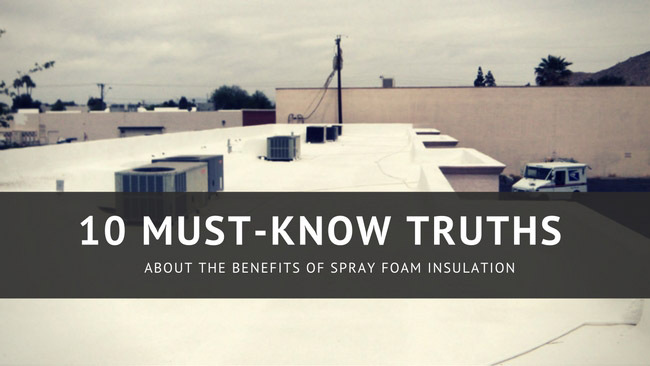 How does the ten must-know truths about the benefits of spray foam insulation sound? Does it sound like the ideal insulation for your Arizona residential and/or commercial building? There is no question about it, right? It will lower your energy bill, protect your home from Arizona’s weathers, and it strengthens the structure. 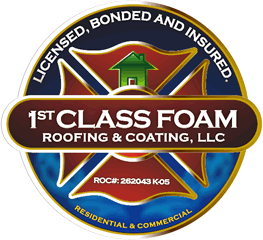 If you are interested in spray foam insulation, contact 1st Class Foam. We are a team that dedicated to professional and quality workmanship.